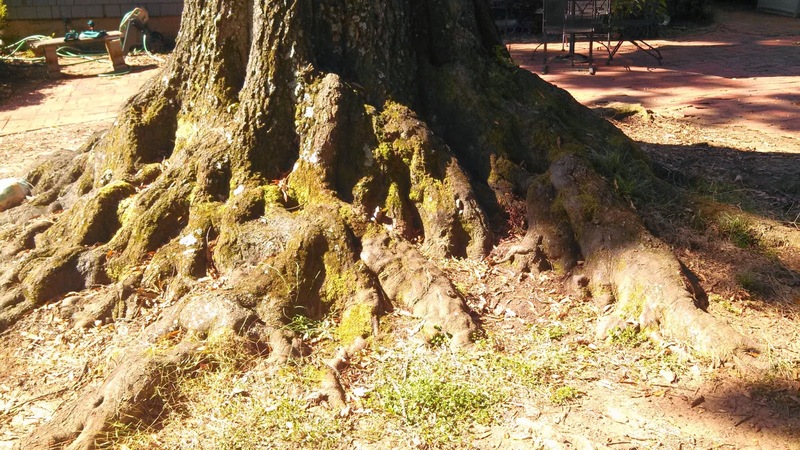 The Wandering Arborist: Is it over reacting? Trees respond to damage or decay by forming reaction wood. The placement and extent of reaction wood can be telling of where and how long the tree has been affected by decay. When we think about a tree responding to decay organisms, most often our first thought is the compartmentalization of decay in trees (CODIT) model. However, the CODIT model is based upon a tree's reaction to damage to the bark and cambium. When decay enters from the tree's structural root system, or perhaps an old tap root that has died off, trees react a little differently since the decay organism is growing in duramen (heartwood) tissue, which is effectively dead structural tissue. The root flare of the willow oak pictured below has been quite disfigured by years of attempting to out grow Inonotus dryadeus and Ganoderma lucidum. When sampled with an IML-Resistograph, what appears to be a substantial amount of wood reveals areas and pockets of substantial decay.